Arrayit Pathways™ Focused Human Genome Microarrays enable targeted gene expression analysis of every major cellular pathway in the human body. The content is derived from our high performance H25K human genome microarrays, which contain a complete set of 25,509 fully annotated human genes representing every gene in the human genome. Pathways™ Microarrays offer the highest sensitivity and specificity of any product on the market, empowered by long-mer oligonucleotides, proprietary attachment and surface chemistry, and a unique one gene-one spot™ design. Pathways™ Microarrays allow users to rapidly and economically explore adipogenesis, angiogenesis, apoptosis, cancer drug targets, cardiotoxicity, cell cycle, cell motility, cytokine production, DNA repair, glucose metabolism, growth factors, hypertension, JAK/STAT, mitochondria, neurotoxicity, protein phoshatases, stem cells, transcription factors, WNT signalling pathways and many others. Arrayit offers a complete line of instruments, tools, kits, reagents and software to fully support Pathways™ Microarrays experimentation. 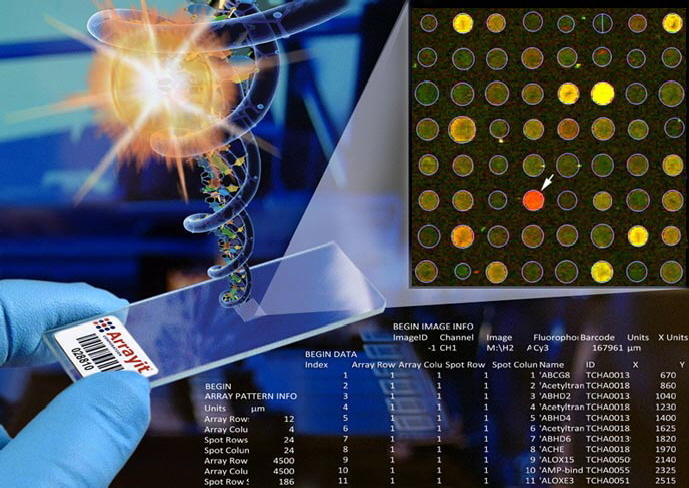 G Protein Coupled Receptors Pathways™ Focused Human Genome Microarrays contain 375 long-mer capture agents for 375 genes involved in the human G protein coupled receptors pathway, printed on 25 x 76 mm glass substrate slides, 10 microarrays per kit.